Normally I’d be in the middle of a major sewing project and at least two knitted escapades, but since taking over as secretary of the Shoreditch Sisters and also aquiring a PS3 and LittleBigPlanet 2 (PS3) , I’ve been too busy to craft as much. LBP2 clearly has to be the crafters choice of games, having a wee knit or fabric sack person and a whole seven levels in a cake themed world, not to mention all the other levels of robot and sticker filled goodness. Splatting baddies with a giant jam sponge while in a world made of battenburg is very hungry work though, so ideally you need a minion to supply endless tea and cake. I made do with too many rollies instead, which as I was so engrossed, burnt down instead of being smoked and have left icky stains (photos will not be shown). Making my first go at cables even harder is my improvised cable needle, which alternnate between being a crochet hook and a double pointed needle. Though as I’ve never used a cable needle I can’t judge whether these make a suitable substitute. 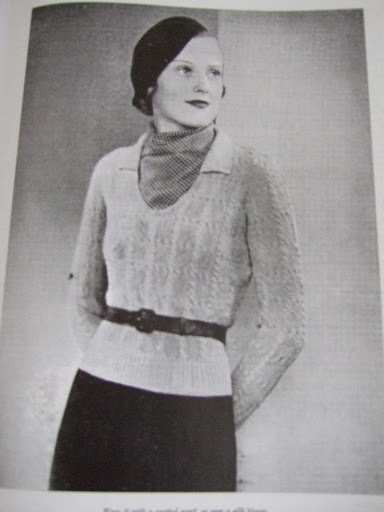 I first heard of “A Stitch in Time” at an advanced knitting lesson at Fabrications, when the most fabulously dedicated to the forties lady I’ve ever met, poopooed it* apparently as there were erros in the patterns. I’ve found that if you know enough about knitting to try these not so simple patterns, then it is simple to spot the mistake. 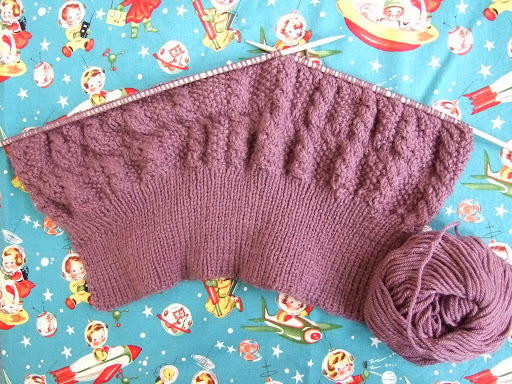 In the pinafore jumper pattern I’m making, it is a case of so many increases in a row not adding up the number of stitches you should end up with. So you add more increases till you get the right number. And even if you’re a beginner and find it hard to work out the right pattern on your own, the book has every pattern twice, explained in two ways. They faithfully reprint the original as it appeared in print in the 20s/30s/40s, including the photos. Then follow it with colour photos of a contemporary version of the knit, with modern yarn recomendations (subsituting wool for vintage patterns is a whole blog post on it’s own) and explain the whole pattern in the more modern jargon. Sometime I’ve actually found the modern way of writing too complicated, and that the vintage pattern explained it in a more straight forward way. The yarn I’m using is even lovelier for being bought with Chrismas gift vouchers and is Rowan Cashsoft 4-ply. *I love this weird phrase, or is it a word? I’m not even sure if that’s how you spell it.